JHipster-UML is a JHipster sub-project that can be used as a replacement to using the entity sub-generator. The idea is that it is much easier to manage relationships using a visual tool than with the classical Yeoman questions and answers. The JHipster-UML project is available on GitHub, it is an Open Source project like JHipster (Apache 2.0 licence). If you like this project, don’t forget to give us a star on GitHub! JHipster-UML is an alternative to the usual Q&A as it offers you the possibility to use a UML editor to create a diagram that will be parsed by JHipster-UML. GenMyModel (not free, but online). JHipster-UML is available on GitHub, and follows the same contributing guidelines as JHipster. Pull requests are welcome, but the commits must be ‘atomic’ to really be understandable. Please note that using JHipster-UML (or JHipster) might be troublesome (one has to install some tools to really be able to use the Node environment without any issue). This link may help if you encounter an issue on Windows. Another issue that can be encountered on Windows is this one. The link provides a solution to fix that if such a thing happens. Finally, an issue has been reported from a Windows user using Git Bash. The JHipster generator’s questions (from InquirerJS) could not work (the user is stuck when answering the questions). You might want to use Powershell or another shell when using JHipster UML (or JHipster). JHipster UML is a tool that can be used with the JHipster’s generator. If you’re using the generator before v3.0.0, then you must use JHipster UML v1.6.5 (latest patch release). Otherwise, using v2.0.0+ is the choice for v3.0.0+ of the generator. JHipster-UML is quite easy to use, you only need a class diagram exported in XMI and JHipster-UML will parse it to create your entities. The class diagram should modelize the entities of your JHipster application domain, thus you have restrictions, you have to follow the methodology. Each entity is represented by a class, its fields are the class’ attributes. An attribute must have a type supported by JHipster, otherwise it won’t work. To have JHipster supported types like “BigDecimal”, “LocalDate”…, you can create a PrimitiveType or a DataType for it. You can look at the tables with all the types supported by JHipster and the validations you can use for each here. Here is an example of a properly created class for JHipster. We have the attributes publicationDate and price set with the types BigDecimal and LocalDate we created as DataType. Note that you don’t need to capitalize type names (except for composed names like BigDecimal, JHipster-UML capitalizes simple names). We just use the examples from JHipster in order to show how to do it with an editor. Please note that we only support the relationships listed in the Managing relationships page. Here, we have a bidirectional one-to-one relationship between Driver and Car, with Driver as the owner of the relationship. Notice that in order to achieve a unidirectional relationship we just removed the citizen label so that Passport doesn’t have it. In this bidirectional relationship, an Owner can have many cars, and a Car can have only one owner. Now the cars know their owner, but not the opposite. Here, we have a many-to-many relationship between Car (the owner) and Driver. To do that you must add the field name between () after the injected field name. We use a diagram from the Oracle HR example available here. As you can see, we changed it as to make it a bit more interesting. JHipster can generate entities and associations between them (one-to-one, one-to-many, etc. ), and in this example we added every type of association (even the reflexive and the inheritance). JHipster doesn’t support inheritance yet (but reflexivity is supported by JHipster, with a warning), but we decided to include it in the example so as to have a solid base to work with. Note that you don’t need to supply the database type (sql, mongodb, or cassandra), as JHipster-UML detects the type for you (from the .yo-rc.json file). The JHipster DTOs can be generated too, simply pass the --dto arg to enable this feature. You can choose the pagination for your entities using --paginate. Finally, you can choose the service for your entities using --service. Please note that using the paginate option and not selecting any entity to generate the pagination for cancels your choice of using this option. step 3 - that’s it! Note: If you want to use the classes and methods available, the preferred entry point of JHipster-UML is the ParserFactory (so that you don’t open the file, read it, find the root element, etc.). JHipster-UML can be configured by the command line and / or by a JSON based configuration file, the jumlfile. The options described in the help can be used in the both but the commande line take precedence over the jumlfile. After executing JHipster-UML, the .jhipster folder will be created (if it didn’t exist before) and filled with the entities present in the XMI file in the JSON format. Please note that one entity may, at least, not be generated: the User entity. It is actually scaffolded by JHipster when creating a new app (and a warning message is displayed by JHipster-UML). Next, it’s pretty straightforward: just run your app! JHipster maintains a list of forbidden (under some conditions) words. For instance, if you want to generate entities for your app, and if this app uses Cassandra, you can’t use the words BATCH in either a field name or a table name. As of v2.0.0, JHipster UML detects such words and immediately throws an exception if it encounters such a case. However, JHipster UML can’t assert with 100% accuracy when a reserved word can or can’t be used. That’s why it warns the user with a yellow message when there could be a risk of using such a keyword. Each editor will be discussed here, so that you know how to get a good XMI file. Note : JHipster-UML can detect faulty XMI files, it will display the first error it finds and exit right away (fail-fast behavior). Note for Mac users: Modelio is behaving weirdly on Mac (the GUI), it may be caused by the graphics and window manager on Mac, as it has not been diagnosed on Linux Ubuntu. It works, but the interaction may not be pleasant. Modelio v3.3 is tested and working, however a bug exists in v3.4 preventing the user from exporting the diagram. This bug is fixed as of v3.4.1. Modelio v3.5.X introduces a bug when dealing with bidirectional Many-to-Many relationships (the error when JHipster UML parses the XMI is Cannot read property '0' of undefined). This problem seems to have been fixed in later version (v3.6.X). Modelio can be downloaded for free here. Make sure you have Java 8 if you’re downloading any of the 3.3+ versions (it won’t work otherwise). The example file is here. Notice the left panel entitled ‘Class Model’. 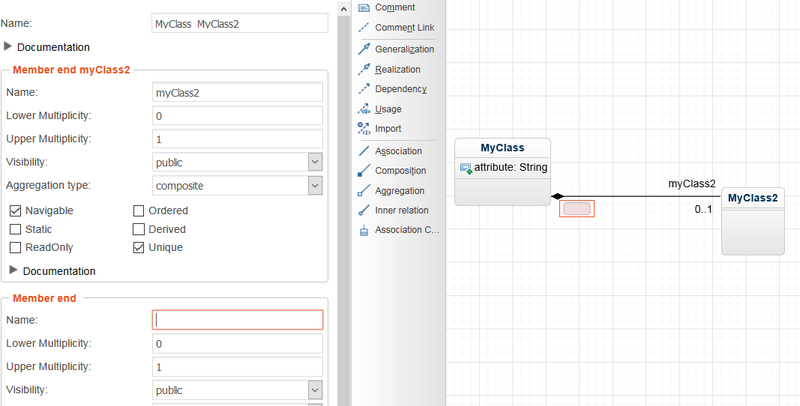 You only need the ‘Class’, ‘Attributes’, ‘Aggregation’, ‘Composition’ and ‘Data Type’ objects. You can already guess why you need the first 2. The ‘Aggregation’ object is used to defined aggregations: B is aggregated to A means that A has 0, 1 or more (n) instances of B. A doesn’t create (and destroy) B instances. Composition means that if A is composed of B (0, 1, or n instances), then it creates, manages and destroys B instances. You can use either of them, the parser will just see the two as associations anyway. In both situations, cardinalities and association names are important. Finally, ‘Data Types’ objects enables you to create custom types (types that are not proposed by Modelio), like BigDecimal, or LocalDate. There is one injected field: job, in employee. This association is called a one-to-one. Go back a few sections to see the other types of associations. Modelio supports constraints. Double-click on a field, go to the ‘Notes and constraints’ tab, the first icon should then be ‘Add a constraint’, then select ‘Constraint’, double-click on the constraint, and give it a name (it should be one of the JHipster constraints). For the constraint value, enter it the ‘Body’ field. Finally, once your diagram is finished, you just have to export it. Check the Model perspective, once you locate your project, get down one level and right click the last element (you lower-cased project’s name), XMI, Export XMI. A window should pop up, select the output path, change the compatibility to OMG UML2.4.1, leave the extension to XMI and you’re ready to go. To comment a class (or an attribute), just double-click on the element, select the Notes and constraints tab, and add a note. Please note that commenting relationships is not possible with this editor. UML Designer can be downloaded here. It works the same way as Eclipse. To create an empty project, just click on File -> New -> Modeling Project. Enter the name, and validate. If no file.uml is created, right-click on your project, and New -> Other -> UML Designer -> UML Model, and enter any name you want. The example XMI file is available here. 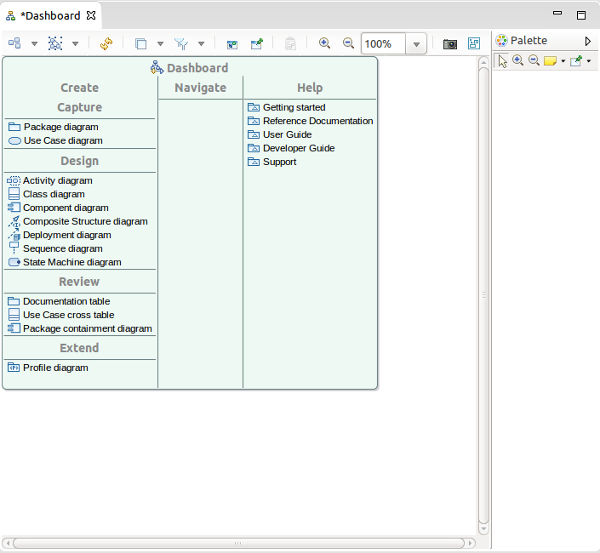 Double-click on ‘Class diagram’ under ‘Design’ category. You can now see on the right the ‘Palette’. You only need these objects: ‘Class’, ‘PrimitiveType’, ‘DataType’ (both under ‘Enumeration’), ‘Composition’ and ‘Aggregation’ (both under ‘Association’). 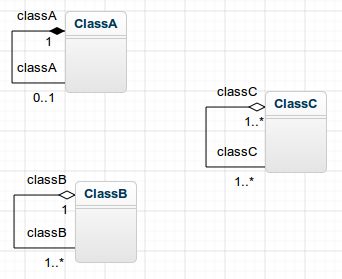 With UML Designer, you can create custom types by either using a DataType or a PrimitiveType (the parser recognizes both). To create attributes, just double-click on the class, and add your attribute. You can import types by right-clicking somewhere on the diagram (in the white-space), then import Primitive Types, then select UML and Java. This will spare you the chore of creating types manually (with DataTypes or PrimitiveTypes). 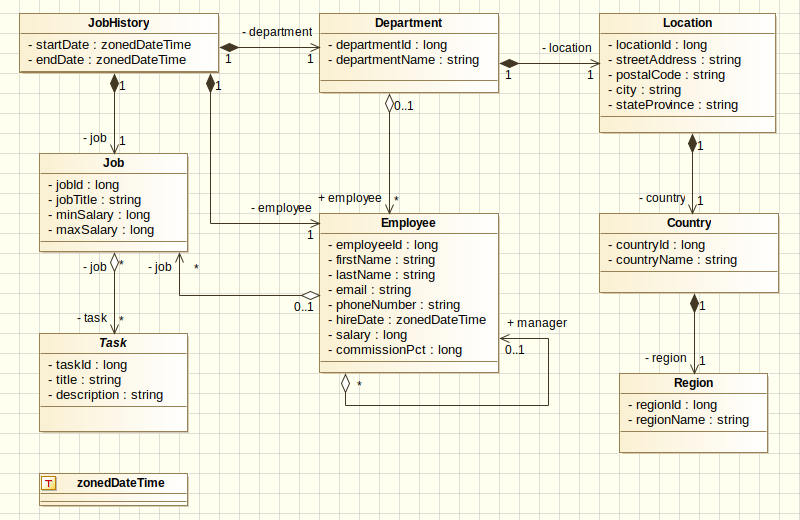 Unfortunately, UML Designer doesn’t support constraints yet. One of the nice things UML Designer provides is that you don’t need to export to XMI, just go to your workspace, and you’ll see that the saved project is already in the right format, so that’s pretty cool. This editor supports unidirectional relationships. To do that, create the relationship you want between your two classes, double-click on the relationship and tweak it. Commenting is possible for classes and attributes (not relationships), and achieving this is pretty easy: click on an element, and select comment to add your own. 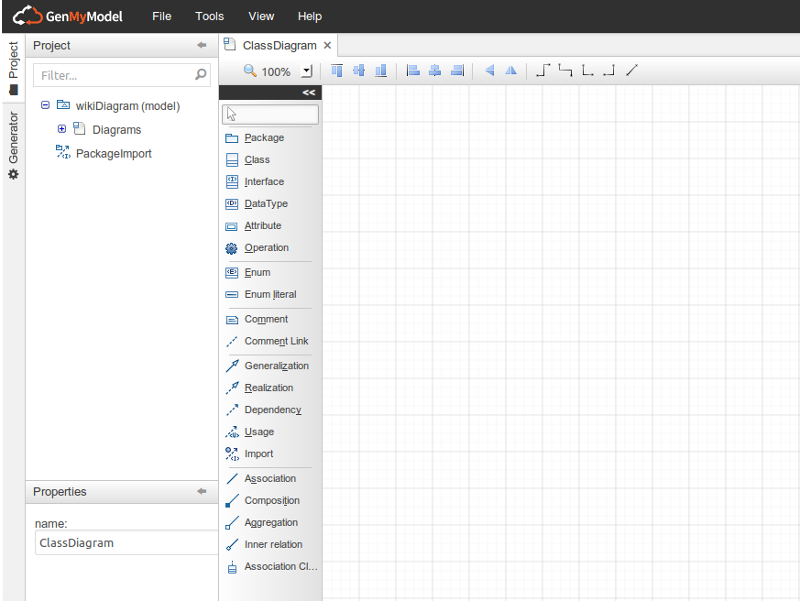 GenMyModel is an in-browser UML editor that can be found here. You can use it for free but with restrictions, we hope that this editor will enable users to fiddle around with JHipster-UML without the constraint of downloading an application. The XMI file example is located here. On the panel on the left of the grid, is all the elements possible to make a diagram. We will need only the elements ‘Class’, ‘DataType’, ‘Attribute’, ‘Aggregation’ and ‘Composition’. You can use either ‘Aggregation’ or ‘Composition’, the parser will only see the association between two classes and its cardinality. Two classes, ‘Author’ and ‘Book’. Attributes, you can set the type with the default ones, or with the declared DataTypes. An Aggregation between ‘Author’ and ‘Book’ (the direction matters!). Two injected field ‘author’ in Book and ‘book’ in Author. The cardinalities (1 and 0..*) mean that a Book can have one author and an Author can have several books, which correspond to a one-to-many relationship between Author and Book. Unfortunately, you can not create custom constraints for attributes to fit the JHipster ones. In GenMyModel, creating unidirectional relationships is pretty easy: just remove the name from the field you don’t want and you’re good to go. Here, MyClass will have a myClass2 attribute, but MyClass2 won’t have a myClass field. 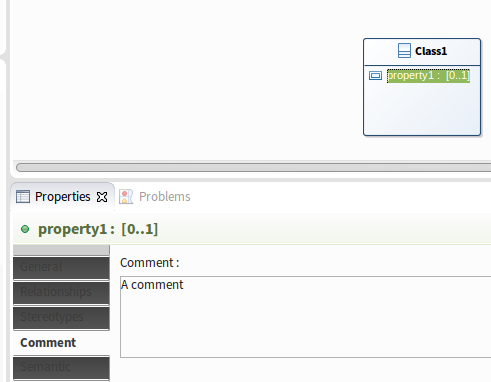 Commenting is available for classes, attributes and relationship fields. Just click on an element and write a comment in the description field. Support for dealing with this editor has been added by Guillaume Finance. Here is the repo, and you can read the presentation here. GenMyModel possess the objects needed: Enum and Enum Literal in the main object panel (on the left hand side of the screen). Since v1.6.2, it is now possible to specify table names for entities. The convention <ENTITY_NAME>\s*(<TABLE_NAME>) is universal no matter the editor. However, if you don’t want to pick a special table name, you can just write the class name. JHipster UML will take care of converting it to an appropriate table name. For instance, if you class name is MyClass, then your table name would be my_class. Note that this feature is available for UML editors since v1.6.2. As of v2.0.0, required relationships are possible to make. To specify one, just make sure the end of the relationship to make required isn’t “0” (“1”, or “*” will do the trick). To see an example of that, just remember the complete HR example from Oracle, and notice that the JobHistory class has 3 required relationships. The tests are available in the test folder and can be run via npm test. We use Mocha for testing (along with chai and expect from chai). ./node_modules/mocha/bin/mocha to run the tests, please note that you may need to use the \ on some “exotic” operating system/s. Bugs found internally (by the JHipster-UML team) may be posted in the issue tracker, except for bugs regarding the supported UML editors. The same goes for enhancements. Note: Post PRs and Issues on JHipster-UML’s github page, here. Not on the main JHipster page. The 1.0.0 release brings a new parser system making any change (parser creation, update, deletion) ultra-easy, provided the XMI is easy to parse. Adding a parser is quite easy. If you’re a Java dev, you’re probably quite familiar with OOP principles (we hope so anyway). When developing JHipster-UML, we thought of its architecture as we’d normally do in Java. You just have to “extend” our abstract parser (AbstractParser), or implement our interface (Parser) to add your concrete implementation of a parser. You should notice that some methods of the Parser interface throw an UnimplementedOperationException. This idea is obviously taken from Java, and you can implement this methods in your concrete parser. Some methods don’t throw any exception, but only call other methods. If you’re familiar with Java 8, we just copied its awesome default methods, and did the same (so that you don’t manually implement them). Just like in Java, you can override any method you want, and create your own. You’re not limited (except if you want to overload). The AbstractParser class provides some fields, a default constructor and some methods so that you don’t have to create or implement them later. Obviously, you should implement each of these methods (or override the #parse or #findElements methods). The getters are not mandatory, but serve as a way of getting some important fields and provide a way to modify them before sending those fields. Add it to the list just like here. 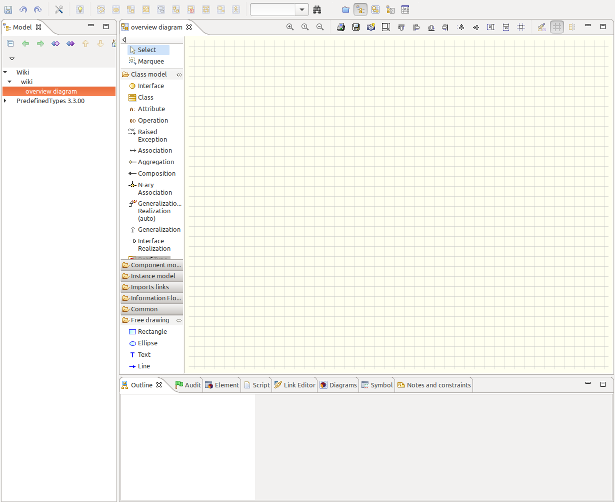 The editor’s class name must be capitalized (Modelio -> ModelioParser, UML Designer -> UMLDesignerParser). Concerning the EditorDetector, it can detect the editor that created your XMI file. For that to happen, you must first locate where the editor is mentionned in the XMI file, and then add the code that returns your editor just like here. If your editor can’t be detected, add it here, and indicate its name just like it has been done for UML Designer here. Finally, the next thing you’ll need to do before committing your super parser is test it. Because we believe in testing, but really like good testing (with BDD), our tests are done with Mocha and chai. If you don’t know what it’s all about yet, we recommend you visit the ChaiJS page, and see one of our test file to get acquainted with it. You should probably wonder what form of testing you should use. The answer is pretty simple: it’s up to you! Whether it’s should, or expect (à la RSpec), we don’t enforce any special rule here. We, however, recommend using Expect because we do, and it should keep the tests fairly easy to understand. You’re not obliged to test the other methods (private ones, because they are supposed to be safe and ever-changing in the short/long term), but as visibility is not implemented in JS (to our knowledge), you may want to test them (it’s up to you). Your test file’s name should respect the same rules as previously mentioned. For instance, if your parser’s name is “Modelio”, then your test file should be modelio_parser_test.js. The same goes for XMI files used for testing. If your parser’s name is UMLDesigner, then one of your test XMI file’s name can be umldesigner_parser_problem_test.[...] (the file extension is not static). Changing a parser (and then committing the change) is pretty straightforward: just do the change and test it (create tests if need be). You can make an XMI file if you need a test to pass (exception throwing, or not, etc.). Don’t forget to modify the editor detector if you change any name. Removing a parser is quite an easy thing to do. First, remove it from the editors (editors/editors.js) and then remove it from the EditorDetector (editors/editor_detector.js). Finally, just remove the parser file and the test created for it. Don’t forget to modify the editor detector if you delete any parser.